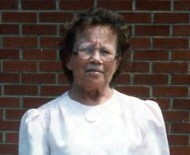 Benson, NC: Ms. Christine Lee, age 91 died Tuesday, February 12, 2019 at Liberty Commons Nursing & Rehabilitation. Funeral Service will be Saturday, February 16, 2019 at 11:00AM at the Rose & Graham Funeral Chapel in Benson. Officiating will be Revs. Joe Earp and Cha Parker. Burial will follow in McLamb Cemetery, Benson, NC. Ms. Lee was born September 13, 1927 to the late Oscar Pearson Lee and Novenia Barefoot Lee. She was a farmer. Survivors, include; sisters, Ruby Holmes of Dunn, Ann Register of Pine Level and special niece, Joyce Johnson of Four Oaks, also several other nieces and nephews. Family will receive friends from 9:30AM to 10:30AM prior to the service at Rose & Graham Funeral Home and other times at the home of Ruby Holmes, 101 May Street, Dunn, NC.